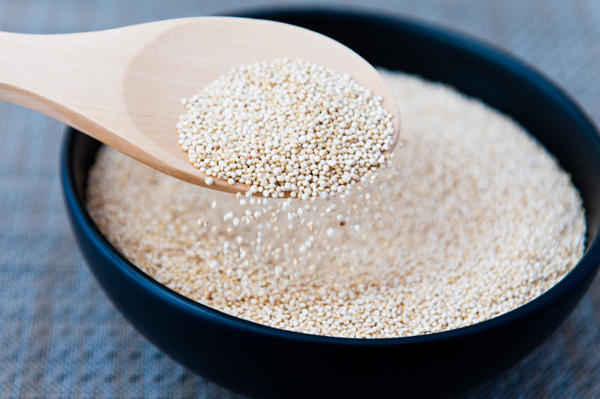 Touted as a superfood, quinoa is high in protein, minerals and vitamins, and is easily adaptable for a range of breakfast, lunch and dinner dishes. Throw it in the shopping basket and give these great recipes a go. Quinoa is the ultimate autumn staple. It’s been gaining popularity in the last few years, with more and more nutritionists singing its praises and a more prominent position in cookbooks and kitchens around the country. Pronounced “keen-wah,” quinoa is believed to have been grown in the South American Andes and used as a staple food by the Incas. Not only is it low in GI, high in protein, iron and dietary fibre, but it’s also packed with vitamins and minerals like zinc and magnesium. There are several different colours (e.g. white, red and black), it’s available in a few different forms and it can be eaten as a savoury dinner dish or a sweet dessert. It’s a great alternative to rice and cous cous, and is a slightly nutty grain that goes particularly well with vegetables. It’s great in satisfying salads, risottos, with stir-fries or even paired with roasted meats. Always follow the cooking instructions of the individual packet, but generally quinoa is simply rinsed, boiled and simmered — like you would cook rice. It is essential to soak and wash the quinoa before you cook with it to avoid a bitter taste in your final dish. Use about one cup of quinoa to two cups of water, add a pinch of salt and bring to the boil before reducing the heat for about 20 minutes. Place the cauliflower and broccoli on a baking tray with oil, salt and pepper and place in the oven until cooked. Rinse the quinoa and add to the pot with the stock and a pinch of salt. Bring to the boil, then simmer for 20 minutes. Combine the quinoa with the cooked vegetables in a large dish, add the ricotta, almonds and chives. Place quinoa, oats and water in a large pot, then simmer for 10 minutes with the lid on. Add the cranberries, cinnamon and honey and stir. Turn off the heat and let stand for about five minutes. Serve with milk or honey, if desired.